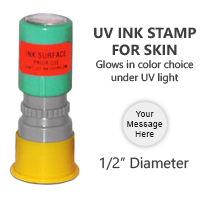 This pre-inked stamp can be customized with up to 2 lines of text and works great for stamping small messages or artwork on skin.This stamp comes inked with UV ink and glows in your color choice under UV light. We also include a 1/2 oz bottle of refill ink with every stamp! 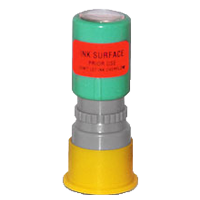 Excellent for entry/exit marking for night clubs, amusement parks, sports functions, casinos, social events, and more! The ink will last for several thousand impressions and can easily be re-inked. Click the customize button to start personalizing your stamp!